Fruity, festive, pretty — but with a punch! This delicious cocktail will definitely get any party started. Fruity, festive, pretty — but with a punch! This delicious cocktail will definitely get any party started. Adding a tiny pinch of salt makes this whiskey sour smooth and balanced. BONUS: The quick and easy cran-cherry syrup can also be mixed with sparkling water for non-alcoholic drink. Note: If you’re concerned about the safety of using raw egg whites, you can substitute with pasteurized egg whites or simply remove them completely. Combine cranberries, cherries, water and sugar in a saucepan. Bring to a boil. Cook until cranberries start to pop and burst, about 3 minutes. Lightly mash with potato masher and strain through fine-meshed sieve, pressing with a spatula. Cool completely. Refrigerate in an airtight container for up to 2 weeks. Reserve cranberries and cherries for another use. The mixture can be can be added to grilled cheese or turkey sandwiches or mixed into smoothies and milkshakes! Makes about 1 cup. Add whiskey, lemon juice, syrup and egg white, if using, to a cocktail shaker. Add ice and shake well. Pour into an ice-filled cocktail glass, stir in pinch of salt. 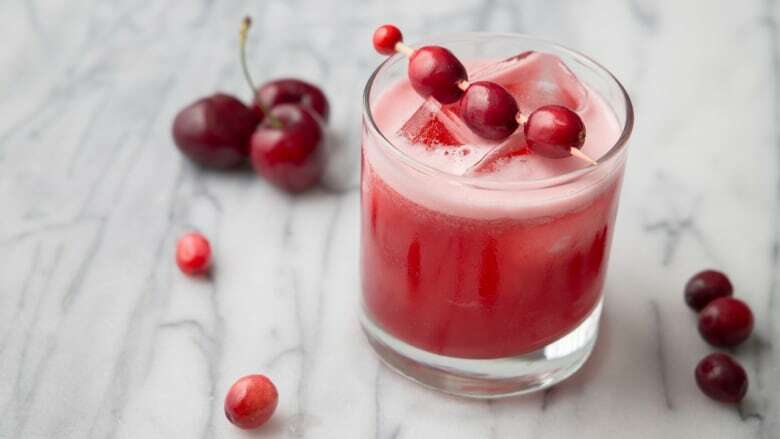 Garnish cocktail with fresh or frozen cranberries and/or cherries, if desired.